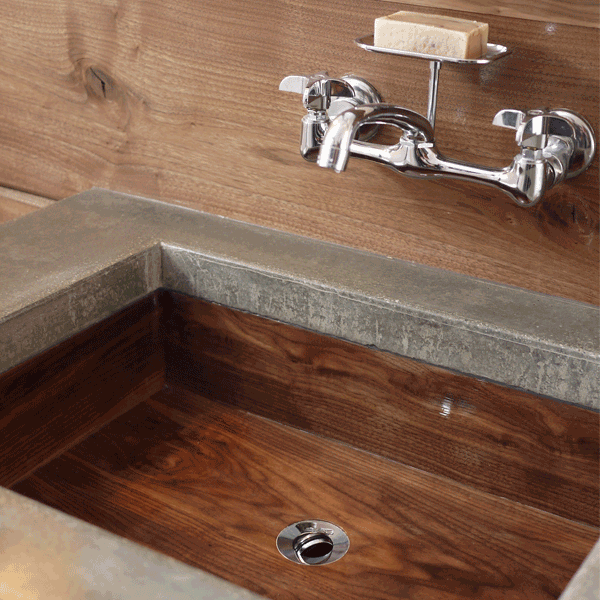 Marble, stainless, porcelain, and even pottery, we’ve all seen sinks made with basic materials but few of us have seen wooden sinks. Mike from America’s Woodshop in Bloomington created a turned wooden sink for the DIY Network’s “I Hate My Bath” and it got us thinking about our planned bathroom remodel. We knew we wanted to incorporate some wood into the design. Why not carry it through with a wooden sink? This is something that I would not have even considered tackling before learning how to run a ShopBot. Sure, I could have made some jigs and routed the drain pan by hand, but that would have been a process prone to human error. If nothing else, I am an expert in human error. With the exact dimensions of a nicely priced stainless steel undermount sink as a guide (and a fallback plan) I designed a simple box sink. 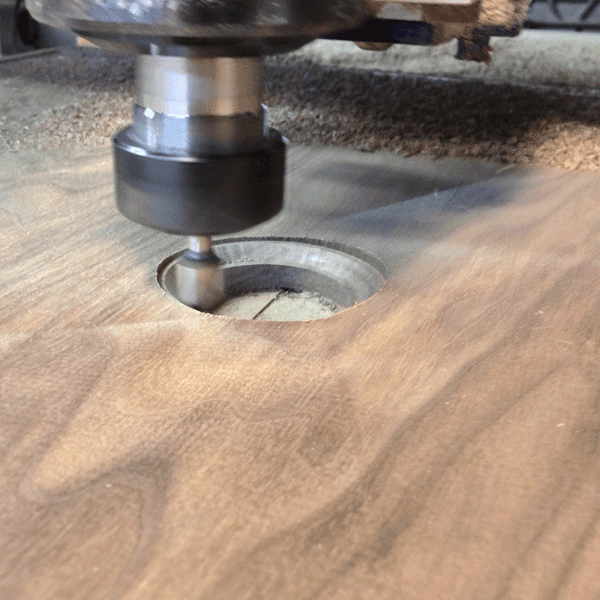 The bottom surface of the sink would be made from a 1″ thick slab of walnut glued up to make a 16″x26″ board. 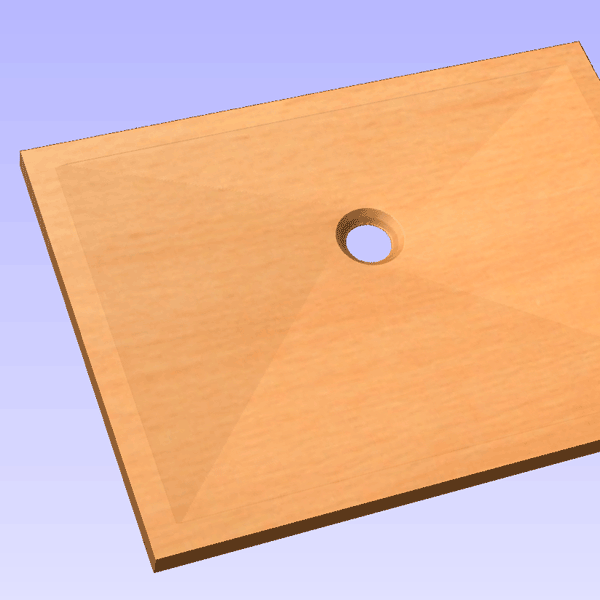 I needed to design the shape of the bottom surface of the sink. Any 3D design software you are comfortable with can be used for this. I used an application with a “2 rail sweep” function. This allowed me to contour everything from the outside edge of the sink, down 1/2 inch, and to the drain at one smooth angle. I tested my design in foam. The foam test worked great so I moved on to the real thing. After assembly, the whole thing was coated in West System epoxy and polyurethane varnish to make it water tight. 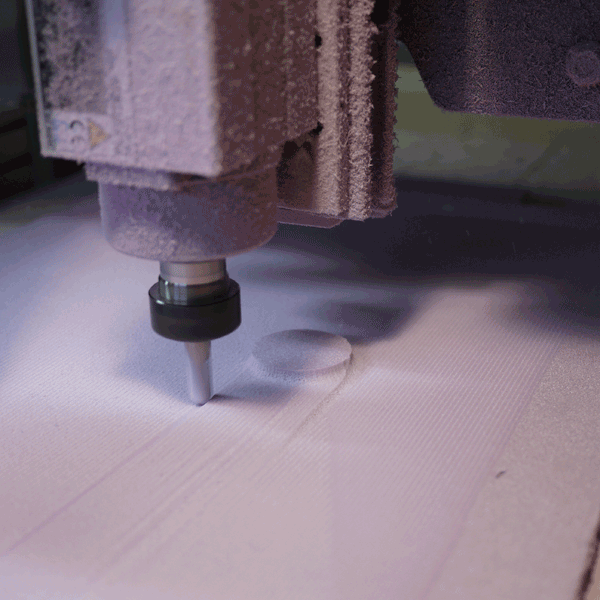 The finishing toolpath took 12 hours to complete on the shopbot with very little sanding to be done once the machining was complete. I could have run it much faster if I was in a hurry. This sink has already generated a bit of buzz. Our friends love it and This Old House Magazine is interested in placing it in their July reader generated issue. It’s been working flawlessly. My wife loves the fact that I am always polishing and cleaning the sink now. Growing up as the son of a shop teacher and a home economics teacher sparked Greg's curiosity for building and making things by hand. This lead to his current passion for exploring cutting edge technology in both the digital and physical. Greg has trained people on and used CNC routers, CNC plasma cutters, 3D printers, laser cutters, and all types of woodworking equipment. Check out his work at Tree On A Hill Workshop. 4 Responses to Wooden sink? Why not? Nice DIY you got there. Your wife should be really proud of you. You present very itntreseing and very relevant data here and your conclusions are most insightful. What will be very itntreseing to see will be the way the digital fabrication tools will interact with existing skills and work-flows once it enters the vernacular, especially since a lot of academic usage focuses on the novelty of digital fabrication technology, as you have pointed out.Unfortunately, from what little experience I have of working with fabricators using digital tools in manufacturing and construction, there appears to be a lot of inertia in changing existing work-flows. The mind-set I often see is people who have invested in the new and expensive equipment are afraid to take risks with the way they use their investment. That’s a good idea. The Wooden sink is so beautiful but I think it is not strong.